In oily or wet conditions, it's important for both safety and productivity that you can securely grip items while protecting yourself from any hazards. The MCR Safety CT1008NF Kevlar Nitrile Foam Palm Coated Safety Gloves offer a brilliant grip in wet, dry and oily conditions while still providing a good level of cut resistance, ideal for automotive and steel industries. A secure fitting design makes them incredibly comfortable and easy to wear. Incredibly durable, the gloves are made with genuine DuPont Kevlar fibres. Five times stronger than steel, this gives the gloves a fantastic level of durability and protection – great for an array of tasks. 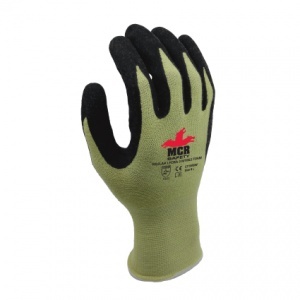 The MCR Safety CT1008NF Kevlar gloves feature a nitrile foam coating on the fingers and palms. This provides the wearer a fantastic level of grip in wet, dry and even oily conditions, ensuring you have a secure grasp on whatever you're holding or carrying.